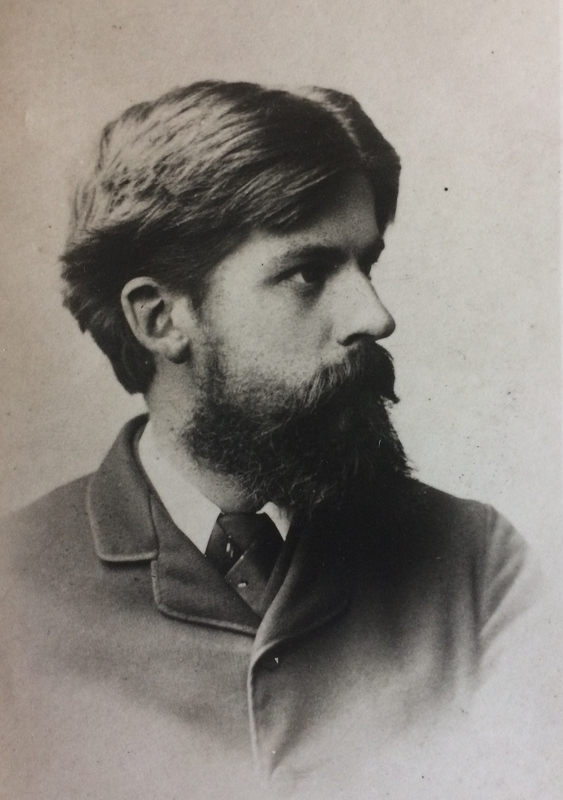 We are delighted to be able to offer an 8-week, archive cataloguing project internship opportunity, working with the Wellcome Research Resource-funded archive project ‘Evergreen: Patrick Geddes and the Environment in Equilibrium’. This is a fantastic opportunity for a student or new archive career professional to develop and demonstrate core archival skills. 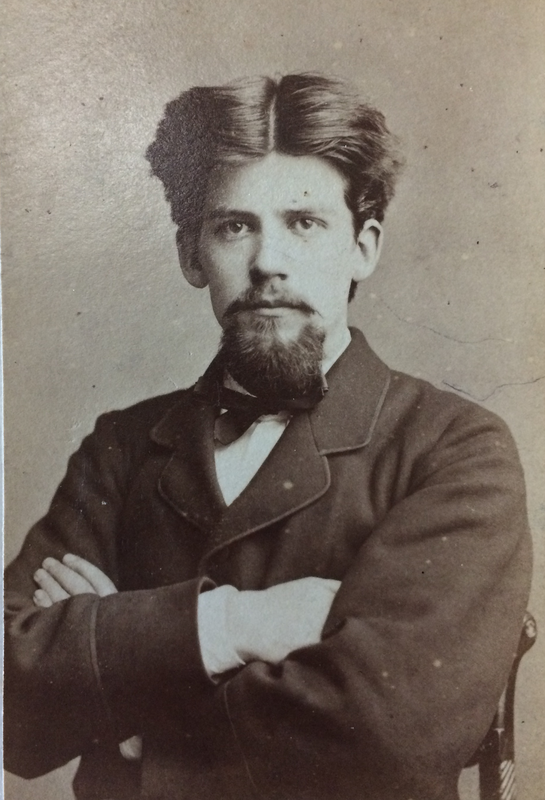 The internship will involve contributing to the enhancement of online archive catalogue descriptions relating to the fascinating correspondence of Patrick Geddes, helping to enhance and promote access to the collections. Closing date: 29 March 2019. Interviews: 18 Arpil 2019. Start date: 13 May 2019. Our project archivist, Elaine MacGillivray, travels to India later this week to deliver presentations at the CEPT Archives (Architecture, Planning and Design) in Ahmedabad, and at the ARTISANS’ gallery in Mumbai. In advance of touch-down in India, we take a brief look at Geddes’ experience there. 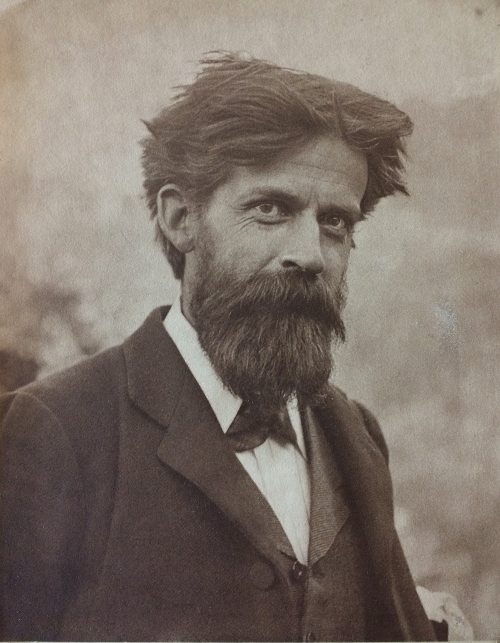 Patrick Geddes first travelled to India in the autumn of 1914. He was 60. Prompted by the success of Geddes’ urban regeneration projects in the Edinburgh Old Town, Lord Pentland, (the then Governor of Madras), had invited Geddes to travel to India to advise on urban planning issues. 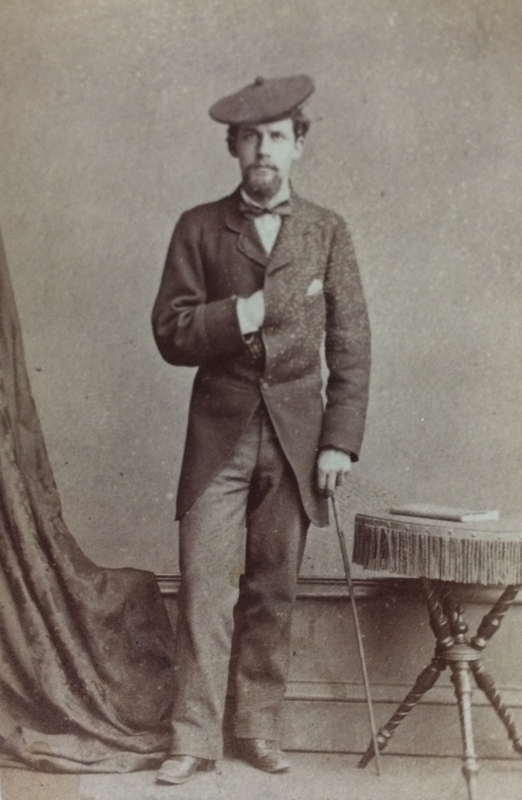 In that first of many seasons that Geddes was to spend in India he was accompanied by his eldest son Alasdair. Together, they travelled thousands of miles across the vast country, all the time surveying each of the cities they visited. After arriving at Bombay, they headed north to Ahmedabad, Ajmer, Jaipur, Agra and to New Delhi before travelling across India to Lucknow, Cawnpur, Allahabad, Benares, Calcutta and then southward to Madras. Geddes had planned to show in India, his favoured tool of civic education, the Cities and Town Planning Exhibition. He faced an unfortunate setback when the ship transporting his exhibition to India, the Clan Grant, was sunk near Madras by the German ship, the Emden. Aided by friends and colleagues at home, a committee, led by H.V. Lanchester, collected and forwarded a replacement exhibition. The first shipment made it to Madras by December 1914. The exhibition, comprising over 3000 maps, prints and photographs and set out on a quarter-mile of wall and screen, opened at the Senate Hall of Madras University on 17 January 1915. Geddes went on to tour his Cities and Town Planning Exhibition across India. The exhibits make up much of the Patrick Geddes archive collections now held at the universities of Edinburgh and Strathclyde. Geddes worked tirelessly to survey and compose reports on Indian cities and towns, 13 alone in Madras. Lewis Mumford, in his introduction to Jaqueline Tyrwhitt’s Patrick Geddes in India (1947), wrote that throughout Geddes’ time in India he worked to promote his ‘broad humanistic outlook on the social aspects of civic improvement’. To quote Geddes himself ‘town-planning is not mere place-planning, nor even work-planning. If it is to be successful, it must be folk-planning’. The measure of the success of a city survey depends on its appeal to the individuals that compose the city: upon its power to rouse each from his, often life-long, training of seeing himself as a self-interested economic man and therefore mere dust of the State – to realising himself as an effective citizen valuing…his contribution to his city, in his city and for his city. 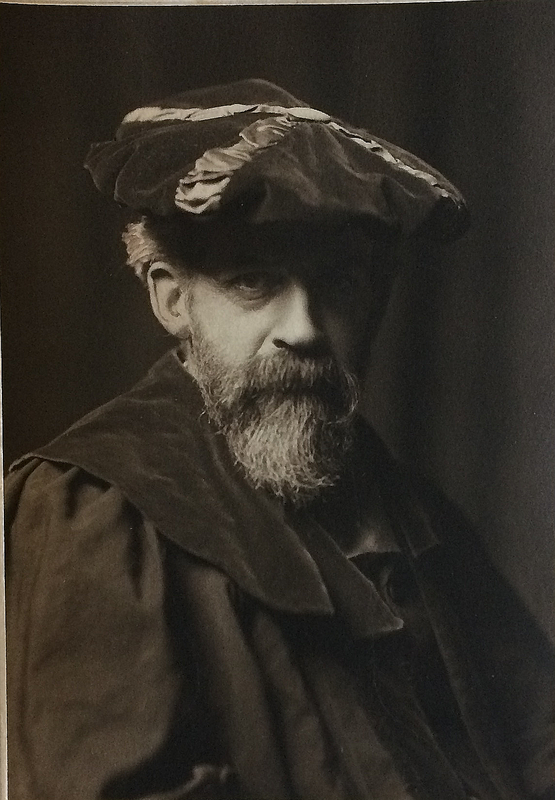 After a season of touring the Cities and Town Planning Exhibition, surveying and reporting on Indian cities, Geddes returned to Scotland in the summer of 1915 to fulfil his teaching responsibilities as Chair of Botany at the University College Dundee. Thereafter, he continued to travel to India each autumn. In 1917 he was prevented from travelling home to Scotland due to the dangers of being attacked by German U-boats. Geddes, at this point, was accompanied by his wife Anna and together they planned a summer school in Darjeeling. They recruited renowned Bengali polymath, poet, musician and artist, Rabindranath Tagore. The school opened on 21 May 1917, and marks the beginning of Geddes and Tagore’s friendship. It was in India in 1917 that Geddes was dealt the harshest of blows. In April, he received a telegram to advise that his eldest son Alasdair had been killed in action in France. He bore this news alone for four months, afraid that sharing the news with his dear wife Anna would accelerate her own illness. Devastatingly, his dearly beloved and stalwart companion, Anna died at Calcutta in the summer of 1917. She was unaware that she had been predeceased by her son. Bereft, Geddes continued to work tirelessly to survey and report on Indian Cities, advocating and adapting his ideas on ‘diagnosis before treatment’, ‘conservative surgery’, and ‘regional survey for regional service’ to Indian traditions and values. His attempt to study and understand the interaction between humans and their environment utilised a range of disciplines including biology, sociology, geography, geology, and town planning. Sometimes he would only spend one or two swift days surveying a city. In others cases, as for Indore, he would spend months, culminating in a two-volume planning report, published in 1918. Geddes returned to Scotland for a period in 1919. 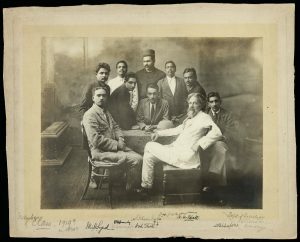 In the summer of 1919, he was offered the Chair of Sociology and Civics at the University of Bombay, by the then vice-chancellor, Sir Chimanlal Setalvad. Now at the age of 65, Geddes accepted the offer. By 1924, Geddes’ health had deteriorated and his contract with the University of Bombay was to come to an end. 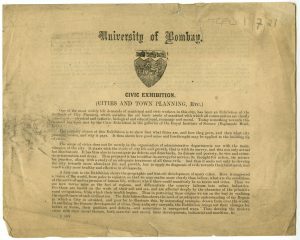 The success or otherwise of Geddes’ terms at the University of Bombay are debated. 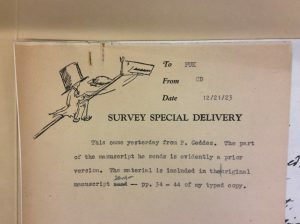 Certainly, there is evidence that the University Senate expressed dissatisfaction at Geddes’ periods of absence (in some part due to his town-planning commitments in Palestine). Geddes left India in 1924 and settled in Montpellier in the south of France. 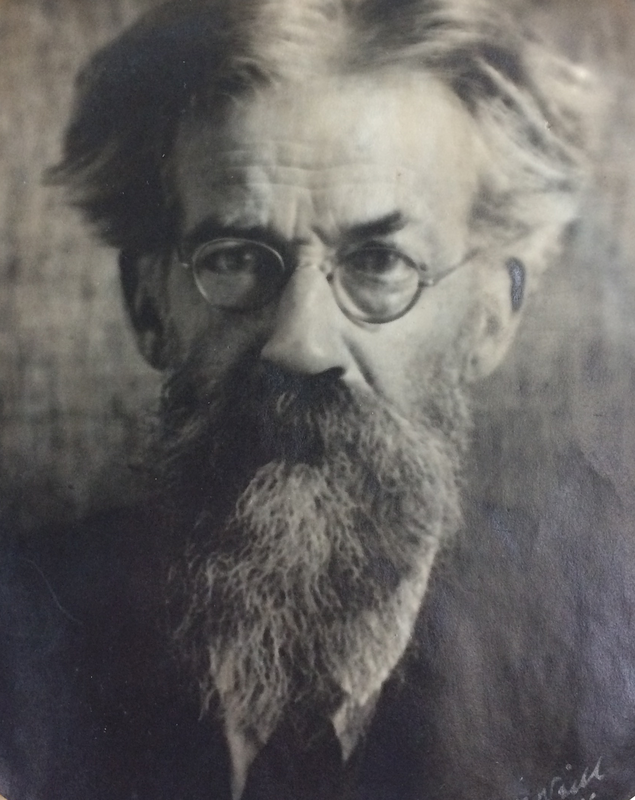 Tyrwhitt, J., Patrick Geddes in India, (1947), p.16. “When we finally arrived at the boundary wall of the early 19th century cottage, now known as ‘Gean Cottage’, I found myself quite moved. Here I was, where Geddes had been…albeit there was almost 100 years between our existence”. 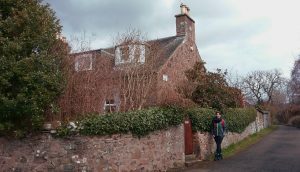 Recently, our project archivist, Elaine MacGillivray, took some time out from her cataloguing work to reflect on Patrick Geddes in his native Perthshire environment. Archivists bear a weight of responsibility in our privileged position as custodians of society’s memory; what we do will matter hundreds of years from now. We aim to effectively manage collections by creating well-informed, reliable and detailed information about the content of the collections to ensure their long-term survival and access to the collections’ content. To do this requires a deep understanding of the collection and its creator. Archivists, as a breed, are renowned for immersing ourselves in the detail of our work and, whilst the detail is important, we are often guilty of forgetting to lift our heads to look to the big picture. Working so closely with the Geddes collections is a constant reminder to lift your head and look out. The collections abound with illustrations of panoramic views of regions, cities and landscapes. There are thousands of illustrations and diagrams which demonstrate the interrelationships and connections between and beyond the boundaries of specialisms. Prolific correspondence and writings reveal Geddes’s beliefs, one of which was that, to better understand a place, one should view it from a position of outlook. In 1857, the Geddes family moved from Ballater, Aberdeenshire, to ‘Mount Tabor’, a cottage on the side of Kinnoull Hill overlooking Perth. 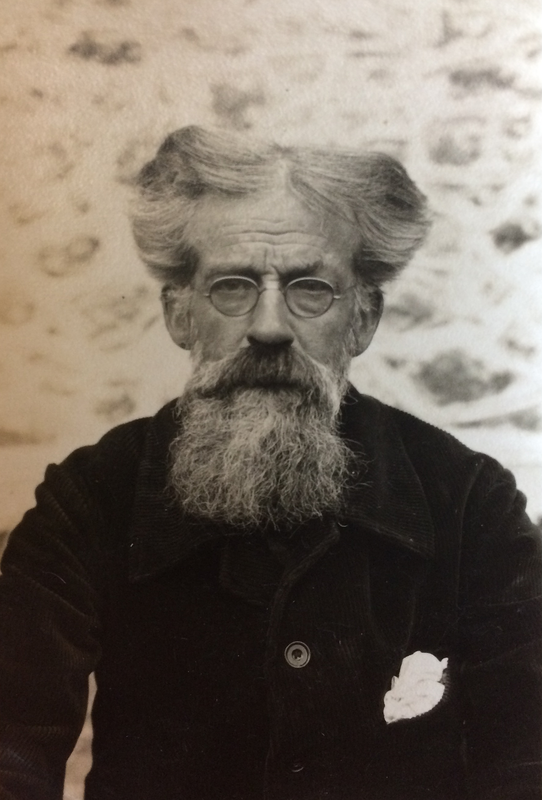 Patrick Geddes was three years old at the time and he remained there until he was twenty when he left to continue his studies. I recently had the opportunity to take to the Perthshire hills in his footsteps, to see the world through something of his eyes and experience. This was also a chance to remove myself from the detail of collections cataloguing and to lift my head and look out. I could immerse myself in quiet reflection in the natural environment and by doing so to deepen my understanding of Patrick Geddes. I think he would have approved. One rather fresh but clear weekend in early April a colleague and I set out from the Den of Scone on our Perthshire/ Geddes pilgrimage. We began surrounded by mature trees and despite being spring there were not yet buds on the trees and the remnants of autumn detritus still covered the woodland floor. We followed a muddy track (insert squelching noises) and to our right ran a burn. We crossed the burn by a footbridge and then the path climbed more steeply eastward. Occasionally we crossed a single track road banked by a high beech hedge on one side and spiked holly bushes on the other. At Bonhard House we turned southwards and navigated the path alongside the ploughed fields which flank the eastern edge of the valley, stopping periodically to watch and listen to a buzzard being harassed by crows. We ascended the steep Coronation Path and at the top took a rest and absorbed what we could of the impressive panoramic vista, looking west towards Ben Lomond and north-west toward Ben Lawers, Schiehallion and finally the snow-capped Grampian mountains in the far north. Having checked historical maps before embarking on our journey I mentally picked off the farms and place-names which would have been extant c.1860 and which Geddes would also have seen: Springfield; Parkfield; Limepotts; Muirhall; Corsiehill; Gannochy, and Kinnoull Hill. My colleague and I chatted about the probability of Geddes walking and exploring these very routes 150 years before us, all the time learning and forming the beginnings of ideas which hold such significance and relevance to us today. We came by way of the back-streets of Corsiehill and here I tried to visually erase all of the new housing which post-dates Geddes’s time at ‘Mount Tabor’. When we finally arrived at the boundary wall of the early 19th-century cottage, now known as Gean Cottage, I found myself quite moved. Here I was, where Geddes had been. This man that I had been working so closely with for the best part of a year, albeit that there was almost 100 years between our existence. 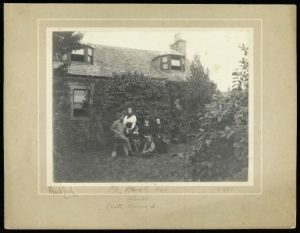 Among the many wonderful family photographs there is an image by Perth photographer, John Spark, of Geddes’s wife, Anna and their children at the garden gate. The ivy has grown up and over the garden wall now and the garden itself is much more manicured. I found myself placing my hand on the garden wall beside the gate, wondering how many of the Geddes family had touched the same spot. And while I have never taken for granted the immediate and emotional connection to our past that archive collections can afford us, I was struck afresh by this new and very tangible connection to Patrick Geddes. Project Archivist, Elaine MacGillivray, at the garden gate of childhood home of Patrick Geddes, the former Mount Tabor cottage, Perth, 2018. I was able to experience first-hand much of the environment that informed Geddes’s understanding of place, ecology, botany and so much more and which was undoubtedly instrumental in the formulation of his geographical vision, the Valley Section. I reflected on how Geddes was able to perceive the inter-connectedness and inter-relationships of just about everything, fueled by his place of outlook from Kinnoull Hill. That interconnectedness and those interrelationships are so key to his ideas and beliefs that as archivists, we have a duty to find a way to reflect them through our archive finding aids and collections catalogues. But that’s a whole other blog post. The next time I lift my head and look out, I might write that. This blog post comes from one of our project volunteers, Daisy Stafford. Daisy made a significant contribution to the project in her work data cleansing retro-converted catalogue descriptions. As Daisy points out, this can be one of the more mundane archival tasks that can take up our time but equally an essential means to an end. We were delighted to have Daisy on board and thanks to her great work we are ever closer to that end. Thank you Daisy! 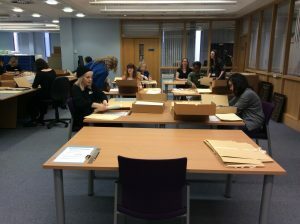 As a postgraduate student, working towards an MSc in Book History and Material Culture, there is nothing as invaluable as hands-on practical experience within your field. My course introduced the range of professional roles that surround working with special collections, but last summer I decided it would be useful to gain further experience within one particular collection. Having volunteered within the Lothian Health Services Archive (LHSA), I was on the lookout for any other relevant archival opportunities. My time with the LHSA had also focused my interest on access issues surrounding collections, particularly how administrative and cataloguing tasks can increase the visibility and facilitate the use of a collection. 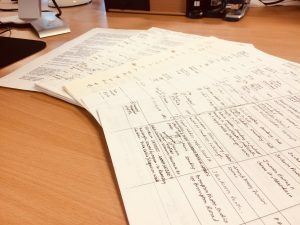 I was subsequently introduced to the Patrick Geddes project, and working with Project Archivist Elaine, I committed a half-day a week to help with a data clean-up task. Using Optical Character Recognition, the data had been retro-converted from an historic printed catalogue into an Excel spreadsheet, with varying degrees of accuracy. The majority of the information was there, but the order was very jumbled and needed manually re-ordered, checked, and tidied to become comprehensible and fit for transfer to the online archive catalogues. Consulting the printed catalogue, and occasionally undertaking my own research, I methodically checked the details for each item, correcting where necessary. I then split the data into separate fields which complied with the International Standard for Archival Description (ISADg): including but not exclusive to; title; date; creator; format; dimensions; scope and content etc. This work would eventually enable the application of Encoded Archival Description (EAD), which would transform the completed spreadsheet into a fully searchable online catalogue. In total, I cleaned over 363 catalogue descriptions. The prospect of increasing the access to and eventual use of this exciting collection is what motivated me through the occasionally monotonous data cleaning. 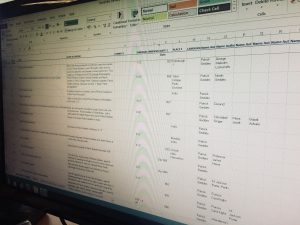 This task developed my previously non-existent archival cataloguing skills, teaching me to interpret, analyse and sort data, identify OCR errors and apply corrections, and generally increase my experience with Excel. It was also a supremely satisfying task for someone as committed to organisation and imposing order as I am. Overall, the experience may have dispelled any romantic notions I had of archivists spending their whole days looking at beautiful collection items, but it impressed upon me the importance of cataloguing tasks in the management of special collections. Since the end of my volunteering on the project, I completed a work placement at the National Museum of Scotland, where I was responsible for enhancing the catalogue records of the museum’s rare books collection. Although a very different cataloguing system, the Patrick Geddes project introduced me to the key data fields and showed me the level of detail necessary for this kind of work. It is an experience that will only increase in relevance as I progress in my career working with special collections. 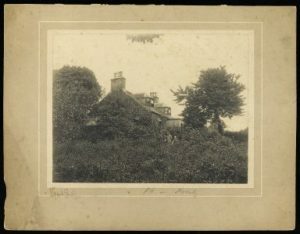 Work continues on re-cataloguing the Geddes family photographs. Working in such close proximity with these photographic collections has provided a rare opportunity to follow intimately the changing face of Patrick Geddes throughout his lifespan. We hope you enjoy the visual journey as much as we did. 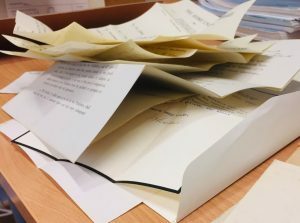 Last week our Project Conservator, Nicole Devereux, wrote about how she had uncovered an unusual sticky situation among the Patrick Geddes Collection photographs. Rising to the conservation challenge, Nicole explored some fascinating and experimental conservation processes in order to resolve this particular problem. Read more about Nicole’s work here. Our project archivist, Elaine MacGillivray, provides an update on cataloguing work. 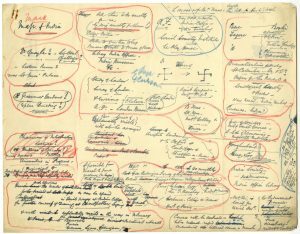 One of the major aims of our Wellcome Research-Resource funded project is to catalogue the papers of Sir Patrick Geddes held at both the University of Edinburgh and the University of Strathclyde. The completion of the cataloguing work will allow the remaining project conservation work to be undertaken and will facilitate the eventual virtual reuniting of the two collections of papers held at both institutions. I am delighted to report that, after a 6 month hiatus, the cataloguing work which was started in 2017, has re-commenced in earnest. 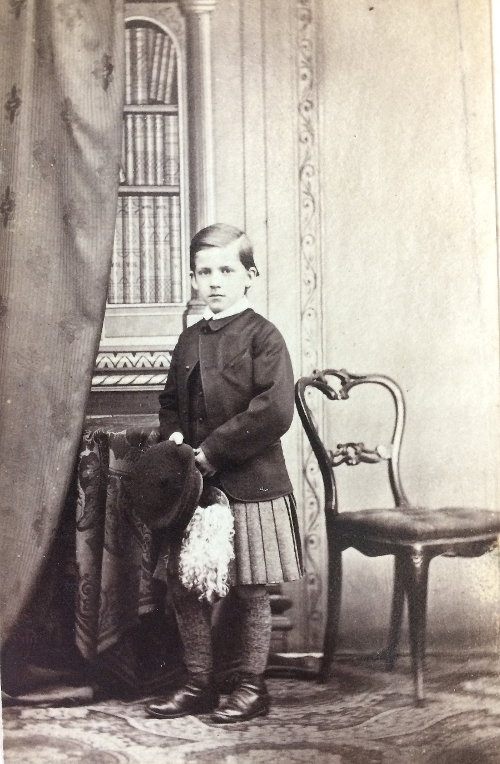 I have been undertaking a stock-take of the Geddes family photographs that are held at the University of Edinburgh, along with creating descriptive content of these for the new collection catalogue. 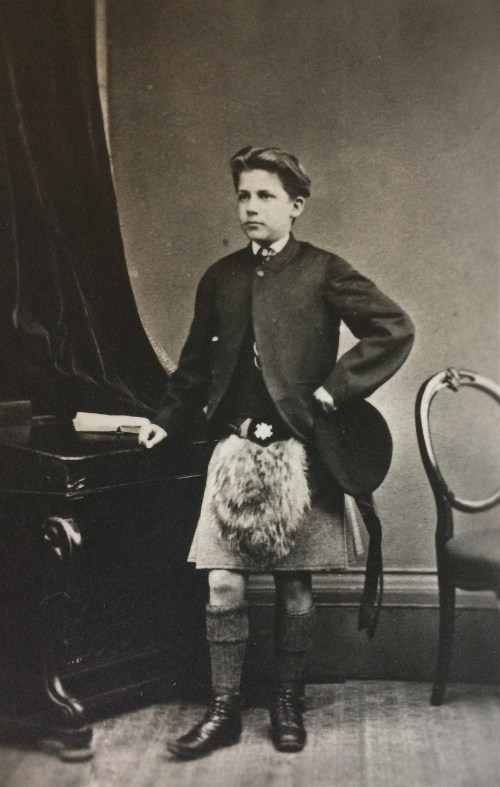 The Geddes family photographs held at the University of Edinburgh are a fascinating series of approximately 175 photographs which range in size, format and content. Photographic processes discovered include ambrotypes, albumen prints, Carte de Visite through to black and white photographic prints. 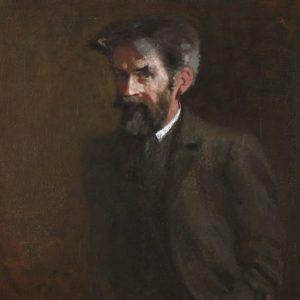 These illustrate not only Sir Patrick Geddes in formal portraits but also include informal compositions of his family and associates in a variety of locations including, but not exclusive to, their home in Perth, Scotland; the College des Ecossais at Montpellier, France; and also in Mumbai (then Bombay), India. The collection contains original items, duplicates and some related items or duplicates can be found within our own collections at the University of Edinburgh and the University of Strathclyde but also at other institutions, such as the National Library of Scotland. 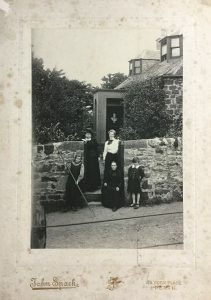 Sample of images from the Sir Patrick Geddes family photographs held at the University of Edinburgh (Ref: Coll-1167/3/GFP). 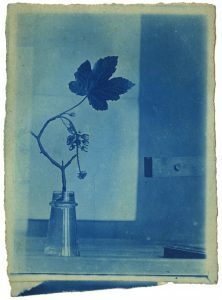 To create a catalogue of a photographic collection, an incredible amount of descriptive content needs to be captured, not only in relation to the photograph subject matter but also in relation to the photographers; photograph formats; the photographic processes; and whether the items are original or duplicate (which is not always easy to establish!). I have also been looking to record the relationships with duplicate or related archive items held elsewhere in other institutions. Thankfully, much of this information had already been captured previously in the extensive work undertaken by our colleagues at the former Patrick Geddes Centre. Sample of legacy catalogues and indexes created by colleagues at the former Patrick Geddes Centre. Containing a phenomenal amount of information these inherited lists and indexes were previously only available as hand-written lists and were each arranged in a different way; some numerical, some chronological and some alphabetical and sometimes with differing descriptive content relating to the same photographic item. A sometimes complex process, the descriptive information gleaned from the legacy catalogues and indexes, was however successfully captured and condensed into one electronic document. Creating an electronic and condensed version of these catalogues which combined all of their content has provided us with a fairly comprehensive interim catalogue of the Geddes family photographs. This is already a fantastic step forward in enabling access to this part of the Sir Patrick Geddes collection. A stock-take of the physical photographs is now well underway. During the stock-take we will also assess the physical condition of the photographs to inform remaining conservation work (this will include re-housing the collection); and additional descriptive content and corrections will be added to the interim catalogue. Once thoroughly checked and edited the content from the interim catalogue will be transferred to the University of Edinburgh’s online archive and manuscript collections catalogue and made available to the public. In the mean-time, we look forward to sharing many of the highlights from the Sir Patrick Geddes photographic collections that we discover in the coming weeks. 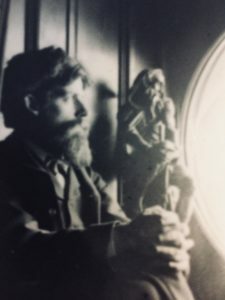 Sir Patrick Geddes sat in window recess with sculpture to his right. (Ref: Col1167/3/GFP/5). In February we held a crowdsourcing event at Strathclyde University. The event took place over two days with the help of 23 volunteers. 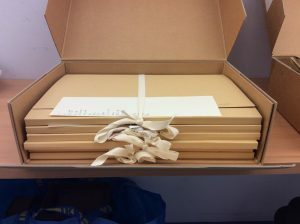 The aim of the two days was to rehouse the Geddes papers in archival four flap folders. The collection required new housing due to it being in non-archival folders that were too small and over filled. This was causing significant damage to the collection and making it difficult to access when an item was requested. The part of the collection best suited for this event consists of 180 boxes of which 153 required rehousing. The rest of the collection has already been rehoused and is made up of journals and photographs. The damage found in the collection was tears, surface dirt, creasing and folds which were caused by unsuitable housing and poor handling before the collection arrived at the archives. Conservation work was carried out to stabalise the material before work could begin. Each day began with a short presentation given by the University Archivist, Victoria Peters and Project Conservator Nicole Devereux. This involved introducing the work of Patrick Geddes, described the conservation work carried out and explaining why the collection needed rehousing. This was followed by a training session on how to rehouse the collection with the rest of the day to start the practical work. In the afternoon subject librarians joined us to chat to volunteers about their roles within the library which was a great way for everyone to network. It was estimated it would take an individual conservator ten weeks to rehouse the material which we aimed to complete in two days. The event was also a great way to promote the collection and to make individuals aware of the Patrick Geddes collection held at Strathclyde University and the University of Edinburgh. The two days were a great success with 143 out of 153 boxes rehoused! The event was well attended with a variety of people from different backgrounds. We would like to say a massive THANK YOU to everyone who was involved. 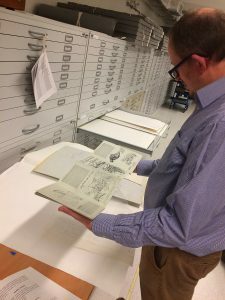 Archives and Special Collections at the University of Strathclyde is home to the Patrick Geddes papers, an incredible collection of over 4000 maps, plans, photographs, prints and drawings and over 45 metres of textual records, pamphlets and books. Patrick Geddes (1854-1932) was a biologist, sociologist and pioneering town planner, and was one of the greatest social thinkers of his time. The collection vividly documents the development of all his theories and is of international significance. 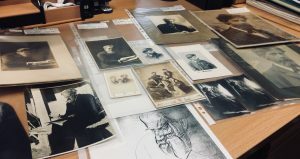 Over the last year, thanks to funding from the Wellcome Trust, the Centre for Research and Collections, University of Edinburgh has been working in collaboration with the University of Strathclyde in conserving the collection. I was very fortunate to be able to volunteer with Project Conservator Nicole Devereux, who is carrying out the conservation work in the project. 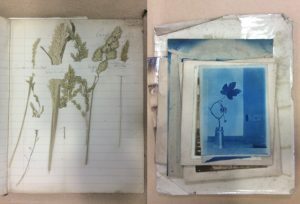 Though I am currently completing my second year of an MPhil in Textile Conservation at the University of Glasgow I was particularly interested in working with the Geddes papers so that I could gain an interdisciplinary insight into the intricacies of paper conservation and archives and special collections. Whilst paper and textile conservation have always been distinct disciplines, similarities exist in the material composition of the objects, the way that they are treated and the approaches that are taken by conservators. Often objects in each discipline will also have elements of the other, papers and books may have fabric samples, or embroidered covers and textile objects such as embroideries often have paper backing or lining. Under Nicole’s guidance I was able to apply my conservation knowledge into a different medium. 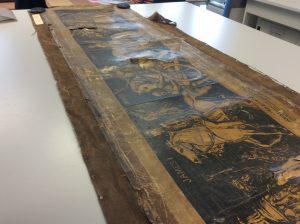 The majority of the collection that I worked on exhibited soot around the edges of the pages this was removed with conservation grade vulcanized rubber sponges. Severe folds that obstructed the text were unfolded with a heated spatula. Tears that were considered vulnerable and likely to worsen with handling were supported with a remoistenable tissue made from Japanese paper and gelatin. 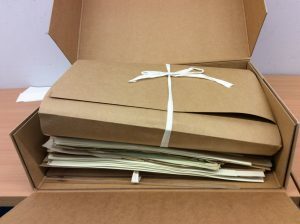 Working with the Geddes Collection allowed me to see first hand the treatment of a large paper archival collection. And how standardizing treatments and storage for a range of different objects can be the most efficient way to conserve an entire collection in a short amount of time. The opportunity to experience the basics of paper conservation has allowed me to further appreciate both the differences and similarities between the two specialisms. It was also a wonderful opportunity to glimpse into the mind of Patrick Geddes. Working through the different boxes I never knew what I was going to find, some days there would be several folders of detailed botanical drawings and on others there were architectural plans for a new university or vegetable gardens for preschools. While my time working with paper is over for now I would like to thank Nicole and Victoria Peters from Strathclyde University for this wonderful opportunity.